Zoo Train: Celebrating 50 years! Don’t miss a ride on the Zoo Train! Two C.P. Huntington trains that circle the perimeter of the Zoo delight visitors of all ages. Operation times may vary due to weather. 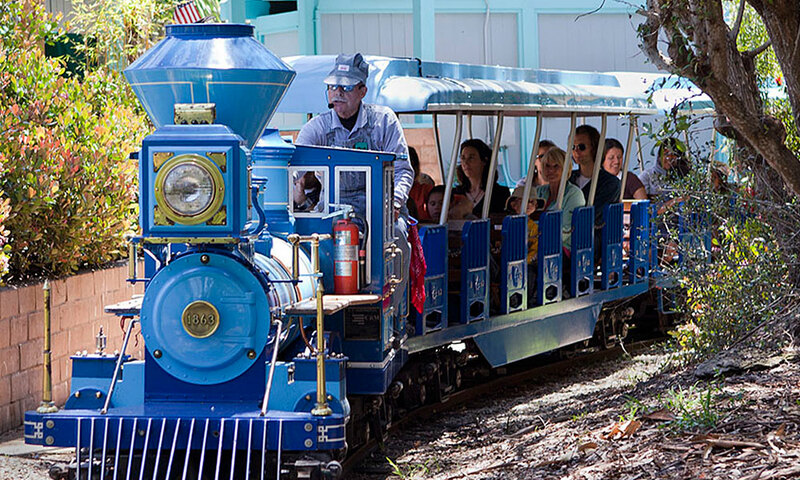 Come aboard and learn to be a Santa Barbara Zoo Railroad engineer! Participants will participate in daily train safety checks, ride with an engineer on the locomotive, blow the Zoo Train whistle, and more. Included are an engineer’s cap, bandana, train whistle, certificate, and a special button. Get more info and buy tickets online. Cost: $160/person, $130/person for SB Zoo Members. Hand feed Masai giraffes and have the experience of a lifetime. Please call ahead to check on giraffe feeding schedule, times or check at the admissions window upon your arrival; feeding times may vary due to weather and/or animal behavior. Open 11:30 a.m.–1:30 p.m. weekdays, 11:30 a.m.–12:45 p.m. and 1:30–2:45 p.m. weekends. Please try to get in line 15 minutes prior to feeding end times. 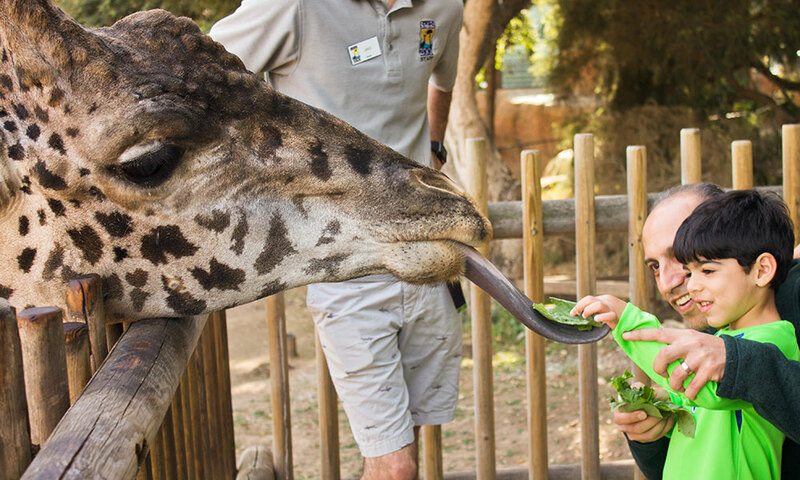 Cost: $8/adult, $5/adult for SB Zoo Members; $4/child, $2/child for SB Zoo Members. The barnyard is home to domestic sheep, which you can feed with specially formulated pellets available for purchase at the Explore Store adjacent to the barnyard. Open daily 11 a.m.– 2 p.m. or until food runs out. $4/feeding, $3/for SB Zoo Members. Purchase at Explore Store. Visiting the barnyard is free. A soaring experience at the Zoo! Climb for Condors on our 26’ rock wall, and learn what it takes to save an endangered species. Climbers must weigh between 45 and 250 lbs. Cost: $6/person, $5/for SB Zoo Members. Open 11:30 a.m. – 3:30 p.m. Friday–Sunday. Operation times may vary due to weather. Search for gems in “them thar hills”– well, near the Barnyard, anyway. Pan for fossils, shark teeth, and gems at Tiny’s Mining Camp (named for the grizzly bear who stars in “California Tales”). 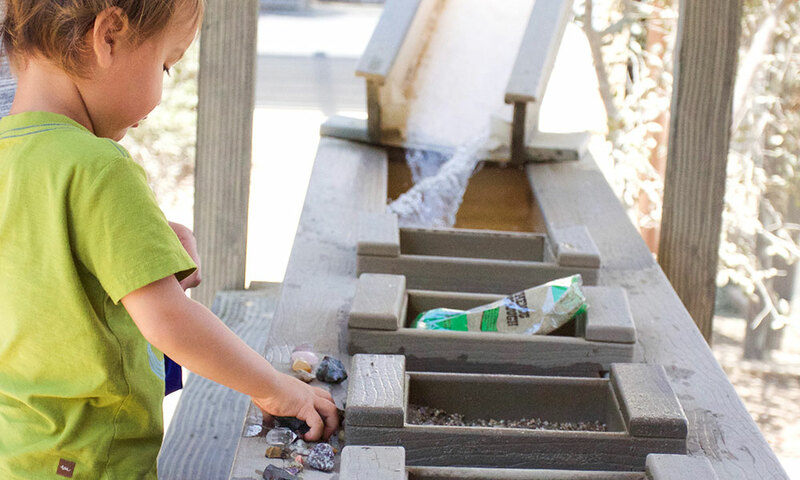 Purchase a bag of “ore,” then sift, shake, and pan for hidden treasures in the 12-foot-long sluice box complete with running water, just like the ones used during the California Gold Rush. Open daily. 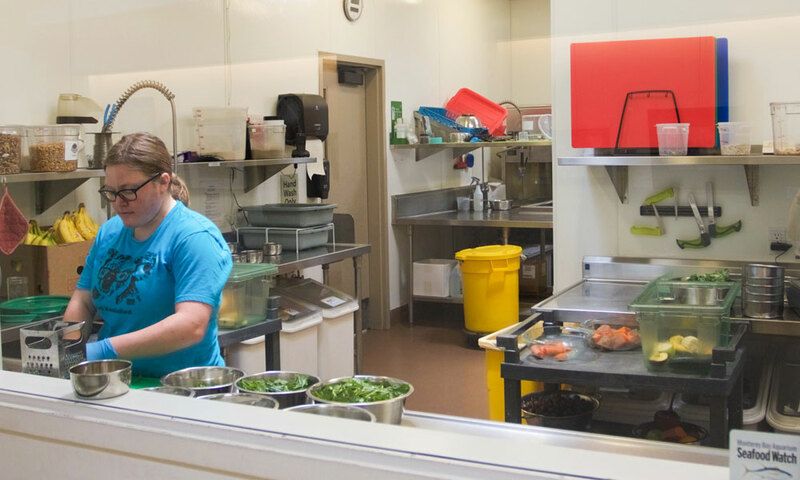 Guests can observe the preparation of food for the 500+ animals at the Zoo from a large window overlooking the Ridley-Tree Animal Kitchen. The beautiful Volentine Gallery in Discovery Pavilion is open to the public during regular Zoo hours and special events. It features changing exhibits that relate to the natural world and the Zoo’s mission of conservation, education, research, and recreation. Cost: free with Zoo admission. 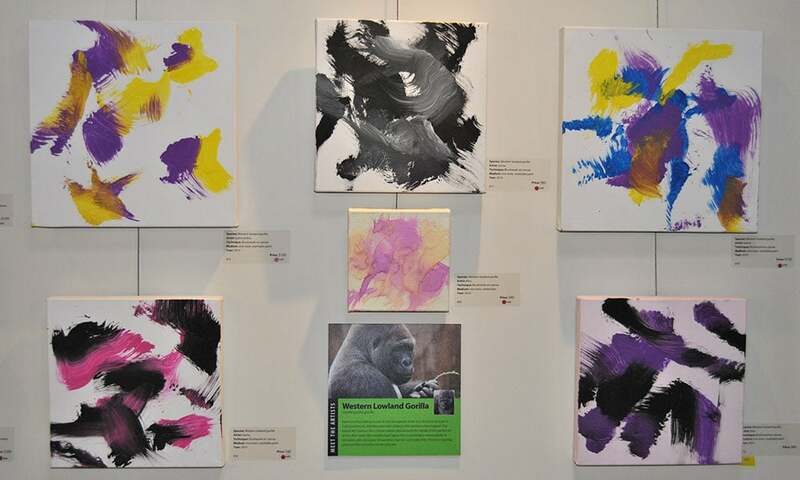 Featuring the creative animal art of Solvang School students. This exhibit is part of a collaboration with the Wildling Museum in Solvang. 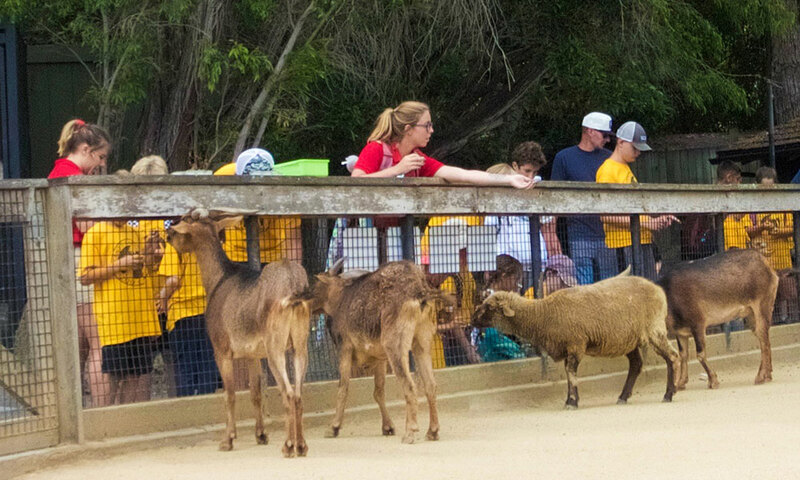 This is your opportunity to go on a guided tour of the Zoo and learn about how zookeepers care for the animals that reside here, conservation issues, and get a close-up view of some of our animals and exhibits along the way. 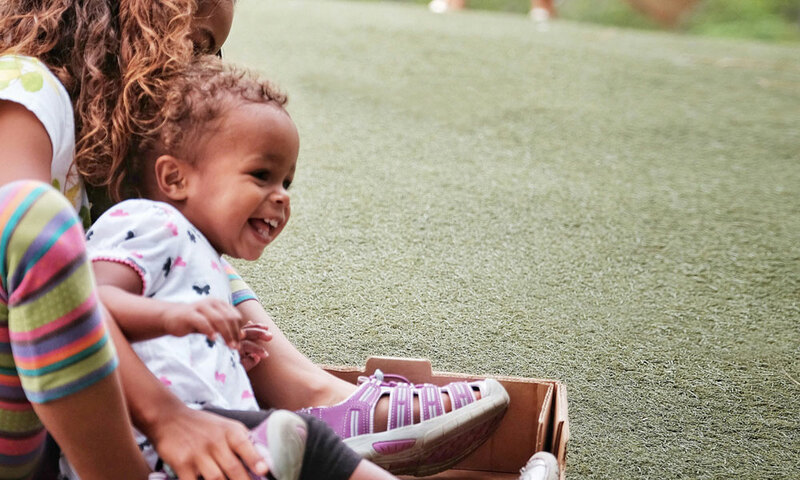 Want to take a break from walking around and let your little one express herself? Stop by the Explore Store to make an easy, eco-friendly craft that’s fun for all ages. Explorer Fundays are held every Saturday & Sunday from 11 a.m.–2 p.m. and are free with Zoo admission. Each weekend features a different craft activity. A place to let your little ‘animals’ run wild! The Kallman Family Play Area, located across from the Zoo Train station, is full of fun stuff for the little ones. Pretend you’re a dinosaur and hide in one of the ‘dinosaur eggs’; be a spider as you crawl across the giant rope web; or, slide or roll down the ant hill, a perennial favorite. “Dino Doc” – Three high-tech dinosaurs get a check-up in a lively 15-minute performance about the Zoo’s veterinarian. “California Tales” – This show features “Tiny” the 8-foot-tall talking grizzly bear aided by co-star puppets: a raven, turtle, California condor, and coyote. Princess Day Weekend (3/23 & 3/24) performances: 11 a.m., 1 p.m., and 3 p.m. Performances on weekends at noon and 3 p.m. Cost: free with Zoo admission. Show times may be canceled due to weather. If you are a morning person, love animals, and are 60+ years old, you’ll love Walk on the Wild Side! Join this lively crew and get your exercise on while enjoying the Zoo. Class meets Tuesdays & Thursdays on Zoo grounds for one hour and is designed to improve cardiovascular fitness, strength, flexibility, balance, and range of motion. Instructor D’ann Lawson will make sure you see lots of animals while you move. Cost: first class is FREE. Sign up at the Zoo’s front gate.